The Castle Point Business and Community Charter Awards were officially launched on 12th November 2015. 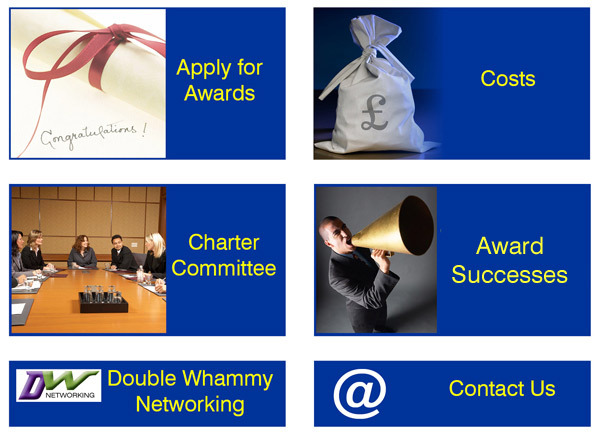 Charter Awards recognise and celebrate the many wonderful businesses in the borough that support the local community. This isn't a competition – it is a robust certification process. Any type and size of business can apply at any time. If you would like to support the local community but don't know how to get involved, subscribe to our newsletter for regular tips and ideas, together with details of our Double Whammy Networking events. A very robust SILVER award for Design 4 Print. The Canvey Island based company provides a great example of how a business can use its core services and the personal passions of the management team for the greater good. On an ongoing basis, the company provides many local charities and community groups with their printing needs either free of charge or at greatly reduced costs, as well as providing local schools and pre-schools with free scrap paper. But football is one of the main passions of the directors and senior management team: getting involved in football-based projects that help promote youth activities forms the core strategy of the company’s community engagement. The aim is to take young people off the streets; help compensate for the lack of youth facilities in the area; encourage a sense of community and generally improve behaviour and health. All employees get involved in supporting the Canvey Island Youth Football Club and Canvey Island Football Club: this includes looking after the financial records of the youth FC, organising and participating in events which include fun days and fundraising events for local charities such as The Danny Green Fund and the Indee Rose Trust, and helping CIFC obtain grants and funds for further development. Many congratulations to Design 4 Print for setting such an excellent example of good community engagement. The SILVER award was very well deserved - but we know that the company is determined to achieve a GOLD award next year.